But they are not talking about comparing two choropleth maps or interpreting a geological map or being able to explain a distinct spatial pattern. They don’t want to know if I’ve mastered map drawing or using exploratory mapping software. No. In fact, they often reference an anecdote that says if you put four cartographers in a car, it will never arrive at its destination because they each think they know how to best read the map. What my students are asking is if I can do with maps what they were intended for—if I can use them out in the wild. My answer remains the same: “Of course.” I am very capable of using maps to navigate around a city or find my way through the countryside. Every other year, I like to put my map-use skills to the test by participating in an orienteering race. During the biennial International Cartographic Conference (ICC), there is always such an event. 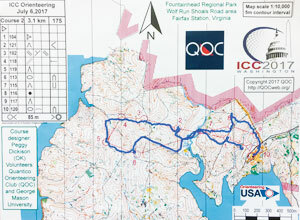 This year, with the conference in Washington, DC, the orienteering race was conducted at Fountainhead Regional Park, about 25 miles southwest of the US capital. Here, myself and about 45 other cartographers navigated our way from the start of a preset course to its finish, using only a map and a compass to pick the best route from one control point to another. The winner is the person who makes it to all the control points in order and completes the course in the quickest time possible. Successful orienteering requires running fast while analyzing the terrain en route and making speedy navigational decisions. It comprises both a physical and mental challenge. 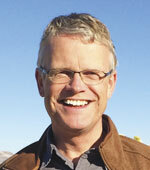 Orienteering maps are like topographic maps but different. 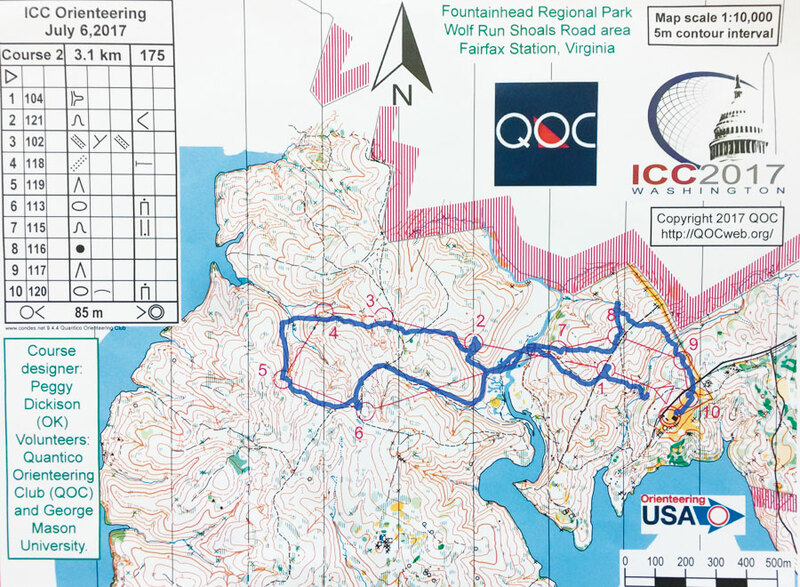 The coloring of the land—which, on an orienteering map, indicates the navigability of the terrain—can be especially tricky. On a topographic map, different colors might indicate different land-use categories, with green often designating forestland. On an orienteering map, however, a forest’s color can vary from white (meaning easy running) to saturated green (meaning impassable). Also, easy running only refers to the land use, not the heights of the terrain. On both maps, however, blue does indicate water, if that is of any comfort. Using what his GPS watch recorded during the race, Menno-Jan Kraak plotted his path in blue on the orienteering map. Using what my GPS watch recorded, I plotted my race in blue on the map to the right. Our course was 3.1 kilometers, or just under 2 miles. This length was determined by the straight lines that connect to the big circles, which indicate the 10 control points we had to pass through. The table in the upper left corner of the map gives additional detail on how the control points are hidden—by erosion gullies (symbol 5) and hills (symbol 6), for example. Racers wore electronic devices on their fingers that they had to put into a companion device at every control point, where it marked racers as having been there and registered their times. My path was just over 4 kilometers (2.5 miles), so a little longer than the 3.1 kilometers of the designated course. Did I get lost? That is a matter of scale. And how fast was this race? On the road, a 4-kilometer race would usually take me about 20 minutes. This one took me just over 50 minutes. That all has to do with the terrain, the weather conditions, and the map reading. There were torrential downpours during this orienteering race, making the slopes very muddy and slippery. Sometimes, it was better—and quicker—to follow an actual path and run some extra distance to avoid waterlogged areas, like I did between points 6 and 7. On the way to points 2 and 7, there was only one bridge to use to cross a stream, so again, it was easier to take a longer detour. And just before point 9, a stream that would have been easy to jump during dry weather turned into a small river that was up to my thighs, so I had to wade through it, costing me more time. Despite arriving at the finish line dirty and completely soaked, this year’s ICC orienteering race was great fun. As for the combined physical and mental challenge? My body did indeed suffer, but the race freed my mind. So here’s proof that not only can I talk about maps, but I can also do maps. And since designing and creating maps isn’t the same thing as using them, I recommend that all cartographers do maps as well—perhaps by trying orienteering—to get a better idea of what users need.